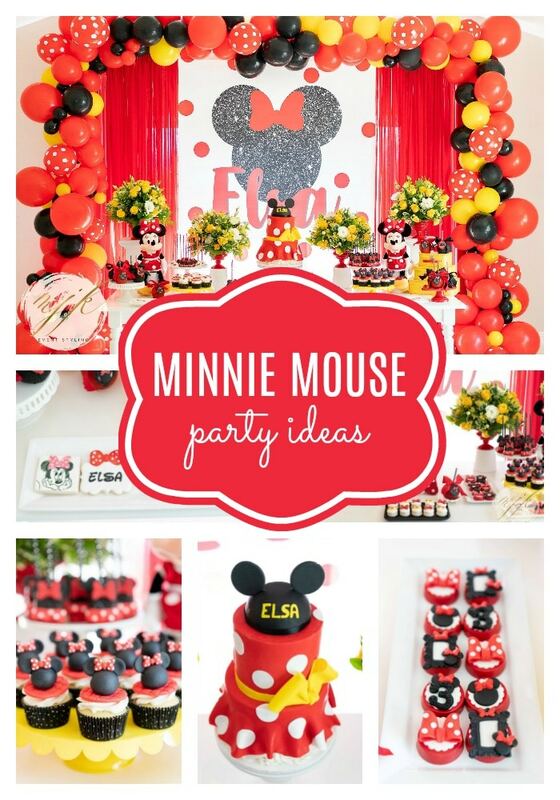 A fun Minnie Mouse Birthday Party?! Yes, please! 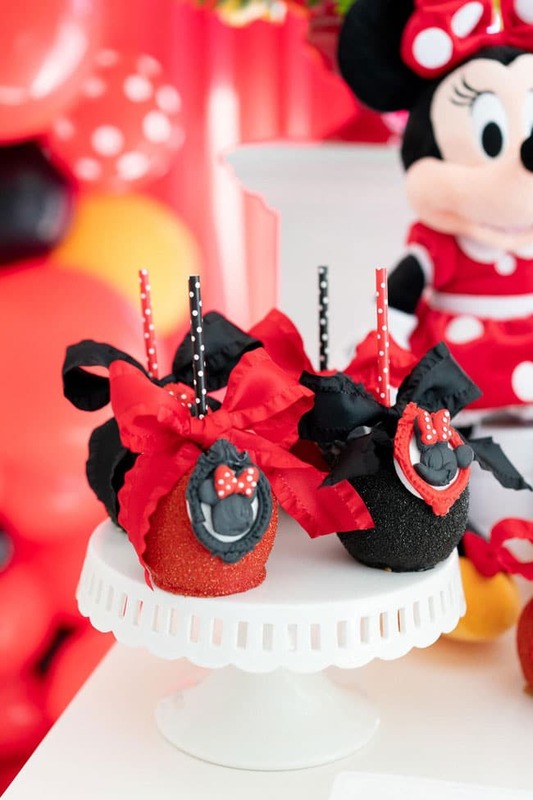 If you have a little Disney lover who can’t get enough of Minnie Mouse, this will be the perfect party for you! 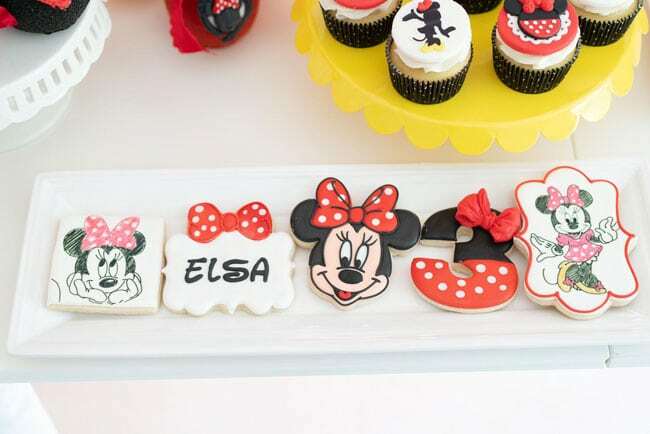 This Minnie Mouse Birthday Party is the epitome of sweet little girl dreams! 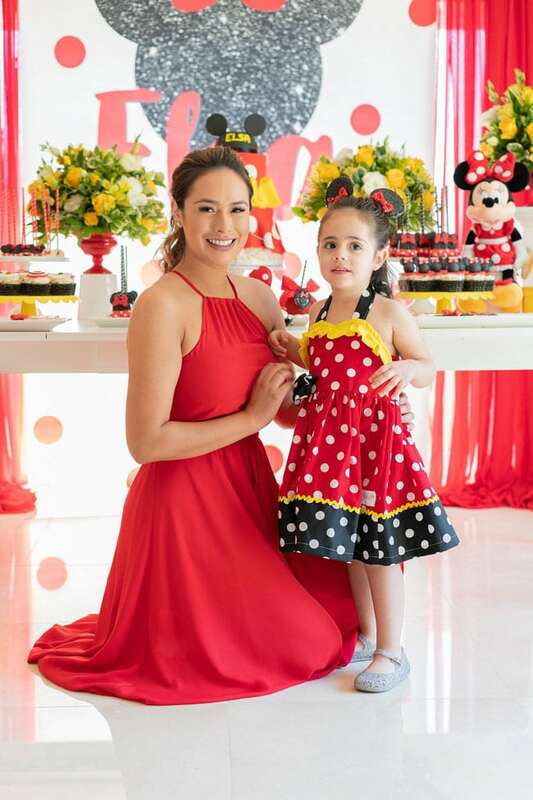 So many great Minnie Mouse Party Ideas were utilized in this birthday celebration that it’s hard to just focus on one or two. The entire party was dreamy and every single detail was picture perfect. 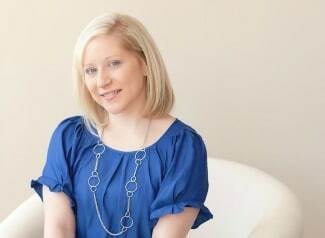 Just wait until you see the amazing styling below! 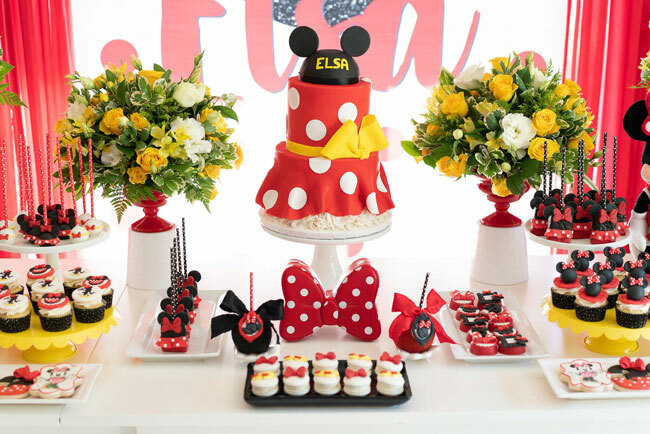 How amazing is the dessert table and backdrop for this Minnie Mouse Birthday Party? 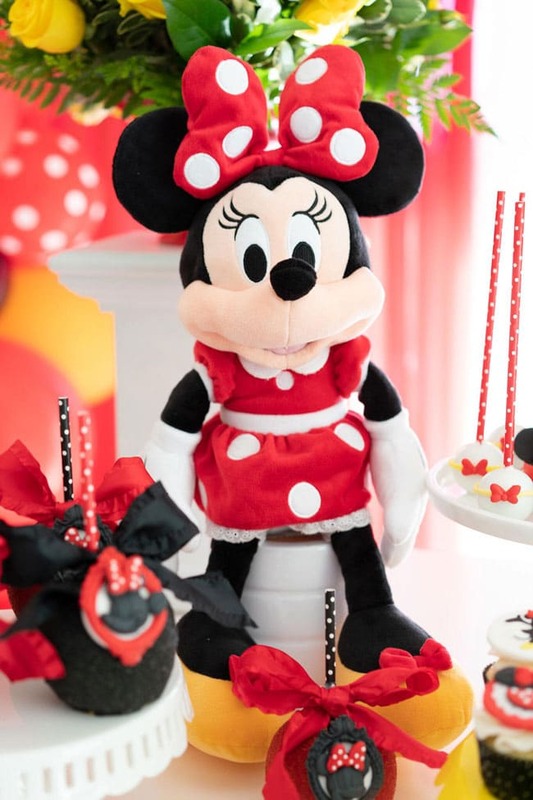 All of the red and white polka dot items around are the epitome of Minnie Mouse fun and they were found on the cake, some of the balloons, and in much of the decor around the birthday party venue! One of our favorite pieces of the entire event is the amazing balloon arch created by Angie’s Balloon Decor. Everything is picture perfect and the balloons were placed in the exact positions that they needed to be to create a uniform look. Gorgeous! 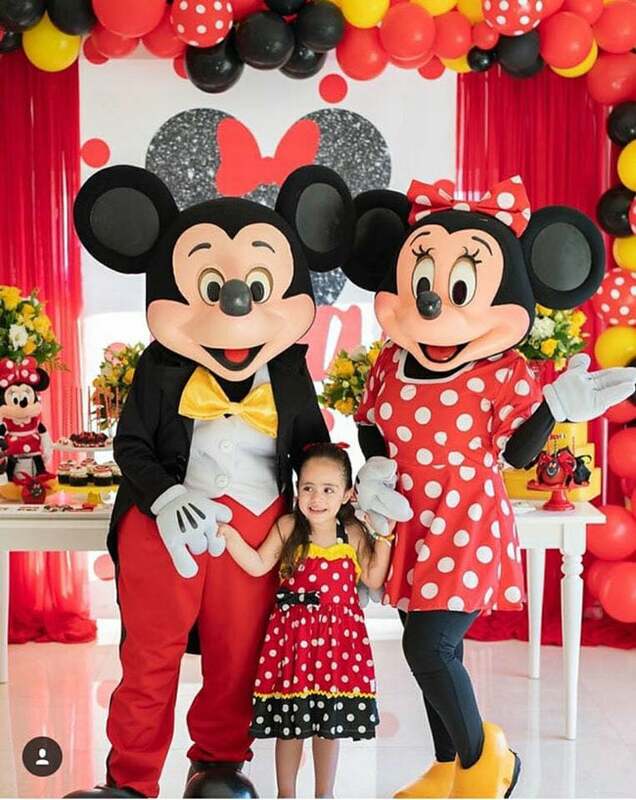 How lucky is this little girl that she actually got to have Mickey Mouse and Minnie Mouse attend her birthday party?! They are a perfect addition to a fun Disney theme and everyone was absolutely thrilled to visit a little with their favorite Disney characters. Look at all of these fun desserts and the cute plush Minnie Mouse that was found on the dessert table! 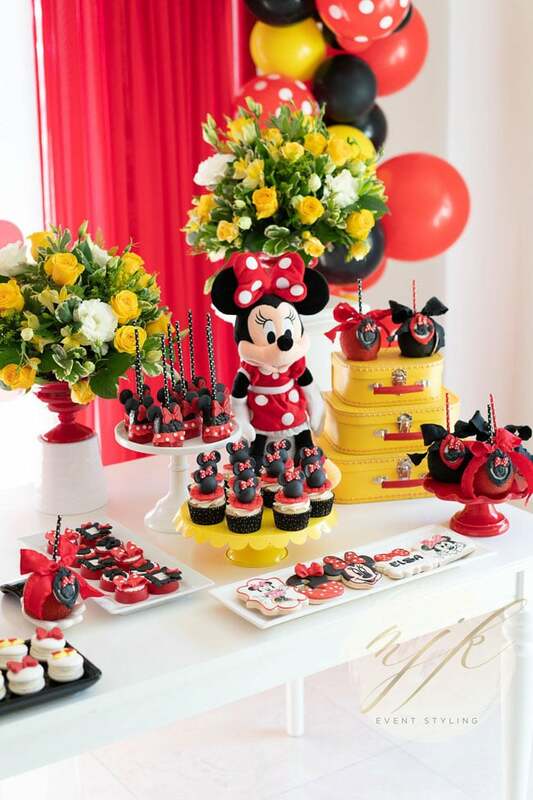 M&J Kreations knew exactly how to decorate a Minnie Mouse Party and every detail did not disappoint! MDCflower’s provided some gorgeous yellow and white rose creations that were found on the dessert table, as well. We love how it helps to make the other items pop and provides a nice balance of color. Most of the desserts were created by Sweets By Gigi, who did an amazing job incorporating the Minnie Mouse Party theme into everything that was edible! We just love each and every one of these desserts that were out of this world! What talent! 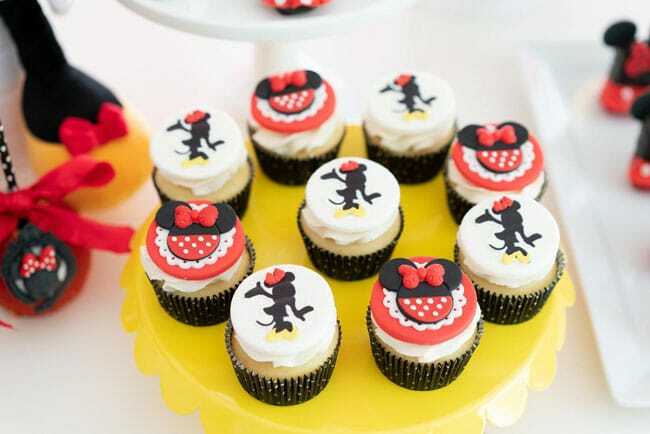 One of our favorites are the Minnie Mouse Birthday Party cupcakes! 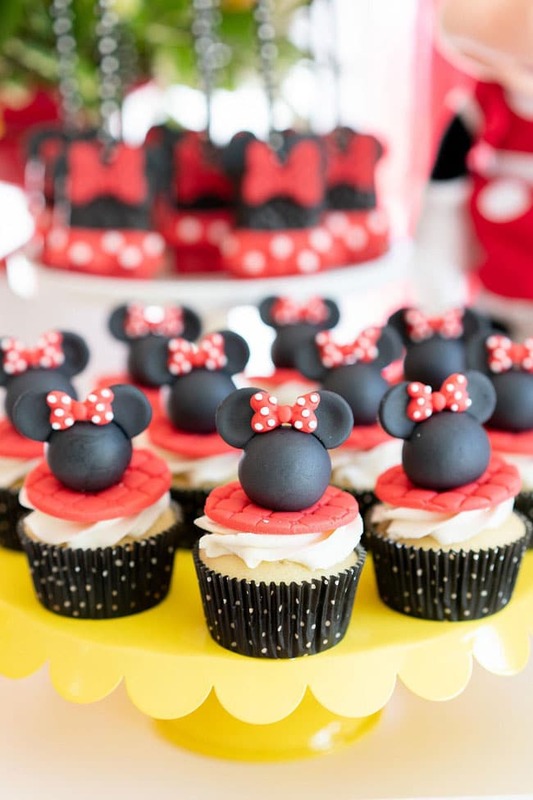 How sweet are the little Minnie Mouse heads that cover the top of the cupcake? It is such a simple concept, yet it brings everything together and is so much fun! 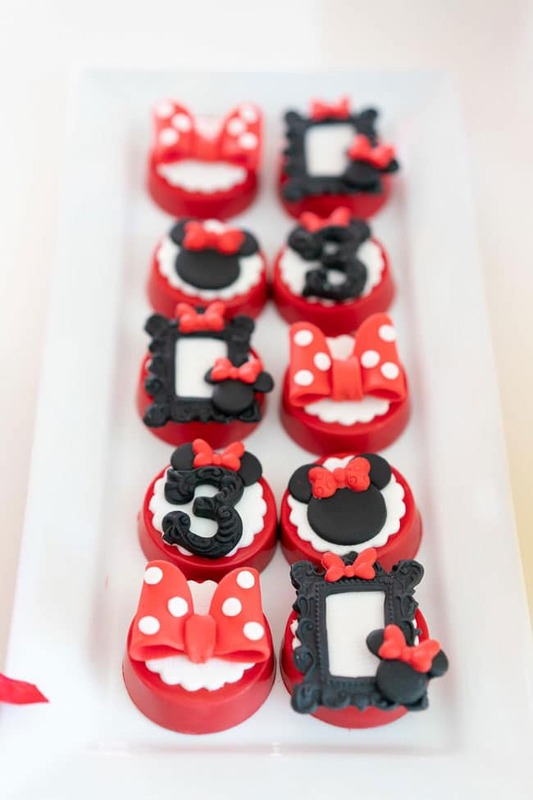 We also love those chocolate covered Oreos with all of the fun Minnie Mouse decor used to decorate them! Nothing was left to chance and the birthday girl just loved all of the cute polka dot red and white bows that were found on the Oreos! 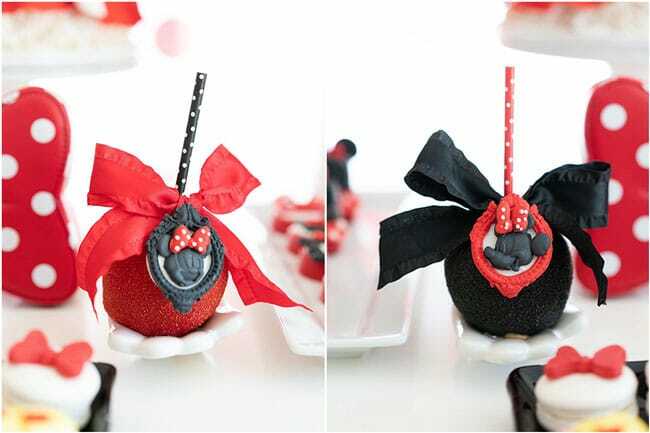 The Minnie Mouse candied apples are incredible! We love the bows that are found around the apple, along with the polka dot straws that were used at “holders” on the apples. What a fun and delightful way to make it easier for all of those little hands to hold onto a big, yummy candied apple! Delicious chocolate covered Rice Krispie treats were available, as well! It was the perfect contrast to a beautiful Red Minnie Mouse Birthday Party. And we just adore the cute “skirt” and bow that were found on the Rice Krispie treat, as well. What incredible details! 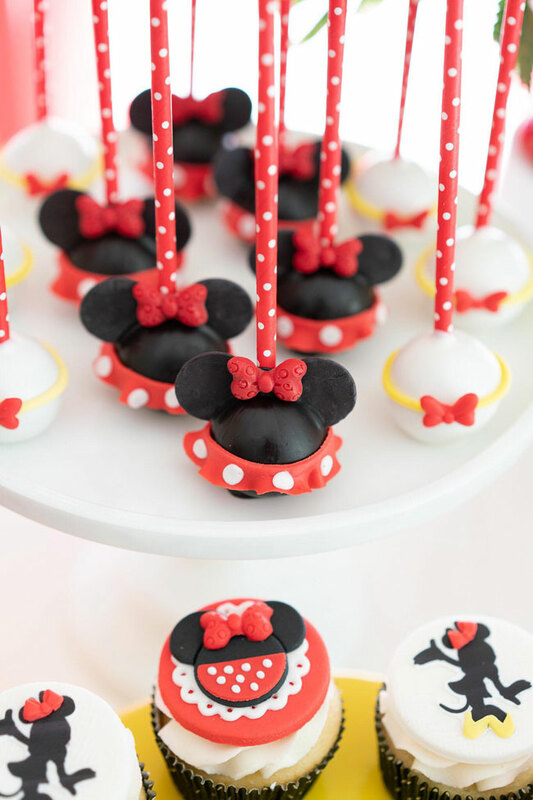 Minnie Mouse Cake Pops were also part of the delicious dessert table and all of the kiddos couldn’t wait to get their hands on them! 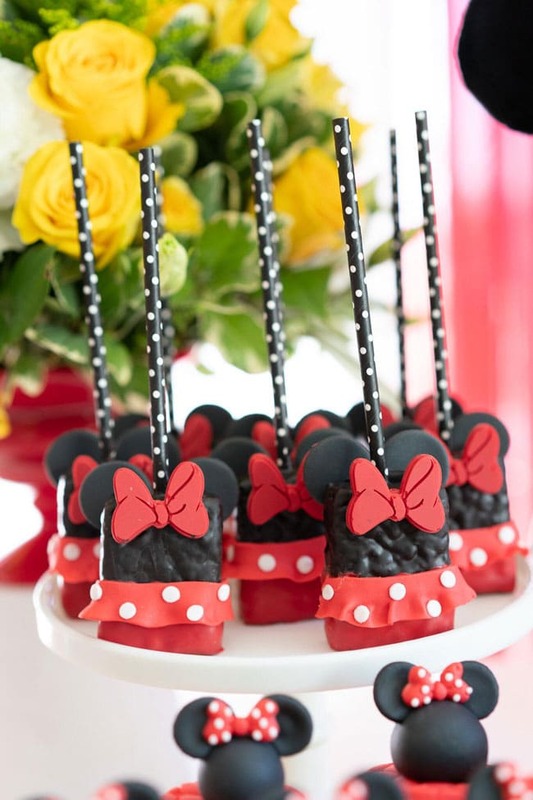 We love the great red polka dot straws that were used as sticks for the cake pops. Everything just oozed Disney and Minnie Mouse! Nothing could top this incredible Minnie Mouse Birthday Cake, though, which was created by RooneyGirl BakeShop! 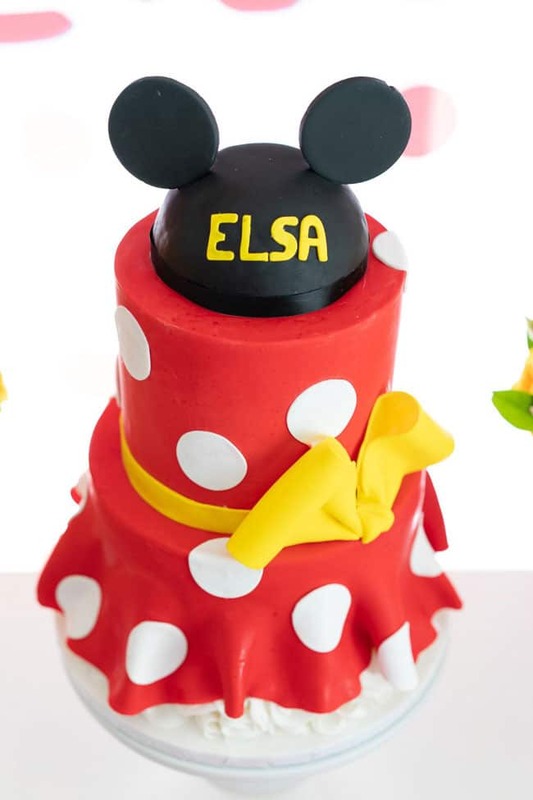 We love the simple Minnie Mouse Cake Topper, which was created to emulate the famous Mickey and Minnie ears that so many little ones enjoy wearing on their trips to Disney! And the gorgeous red and white polka dot “dress” that was draped down the cake was incredible! We just love this and it was the perfect centerpiece to a beautiful dessert table! Minnie Mouse character decor was found on the dessert tables, as well. We are betting that the birthday girl was pretty darn excited to see these, because she was probably hoping she was going to get to take them home with her to cuddle with! What great plush characters that the birthday girl will always be able to have as memories at home! There were so many gorgeous details, which were made so personal and were beautiful! 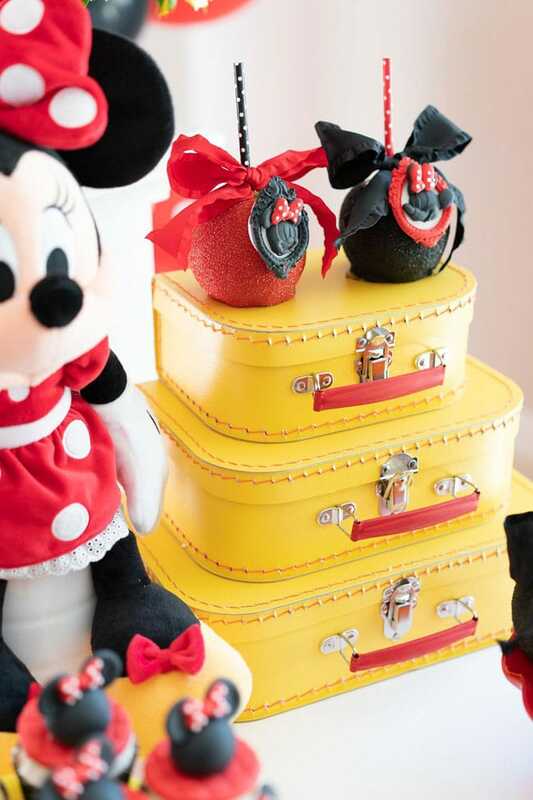 We love these great suitcase decor items that were placed to help show off some of the desserts and decor around the Minnie Mouse Birthday Party. Perfection! More Minnie Mouse cupcakes were found on the dessert table, as well! We love easy to create cake toppers that basically jut need to be placed on top of the cupcake. It makes it so easy to recreate the look on our own, and so many different cake toppers like this can be purchased to make it even easier to create at home! We just love the sweet Minnie Mouse costume that the birthday girl was able to wear for her big Minnie Mouse Birthday Party! Adorable! We’re betting that this little birthday girl is going to want to wear this sweet dress around the house for months to come! Especially those sweet little Minnie Mouse ears! 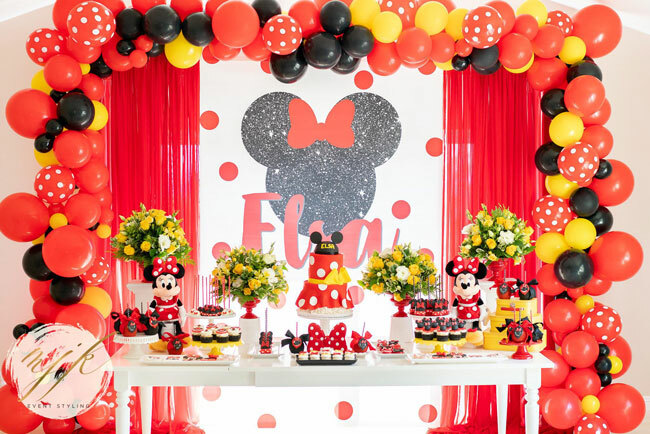 This Minnie Mouse Theme party is going to be one for the record books with all of the amazing styling and design that was put into this event! Every single piece was perfect and we hope that you enjoy it as much as we have! What a lucky little girl and a must for any true Disney fanatic!